Hi, my name's Sean," said the server, flagrantly at variance with his crisp, white, 50s-style gas-station-attendant work shirt, which clearly identified him as "Lloyd." At Bernie's Lunch & Supper, the first foray into Chicago from a nascent restaurant group based in the Detroit area, all the servers wear pseudonyms. Wilbur. Clancy. Felix. Leonard. Bessie. Mable [sic]. Ethel. Buford. Well, gollll-lee. The faux blue-collar aesthetic at play here does little to indicate that this is not Ed Debevic's but a fundamentally pan-Mediterranean restaurant, something further subverted by a few male bussers sporting women's names. Could be, though, that Peas & Carrots Hospitality is referencing its home turf in more ways than one. 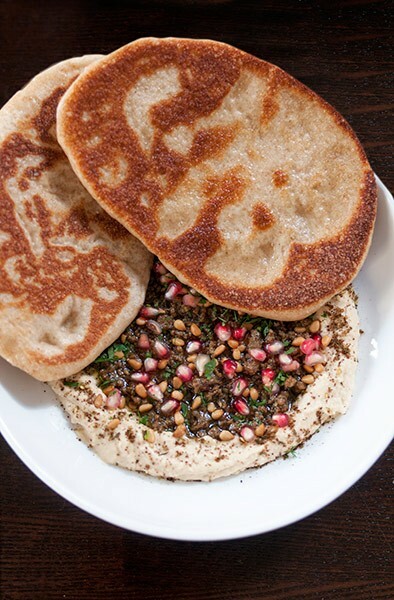 The Motor City and its environs also happen to be the country's culinary capital of Middle Eastern food—and if there's one dish on the menu you shouldn't miss it's the one you're most likely to find in Detroit and the Middle East. Bernie's is named for the grandfather of partner and chef Zack Sklar, a 29-year-old graduate of the Culinary Institute of America with five restaurants already under his belt and a sixth—a franchise of Memphis's Gus's World Famous Fried Chicken—coming soon to Fulton Market. 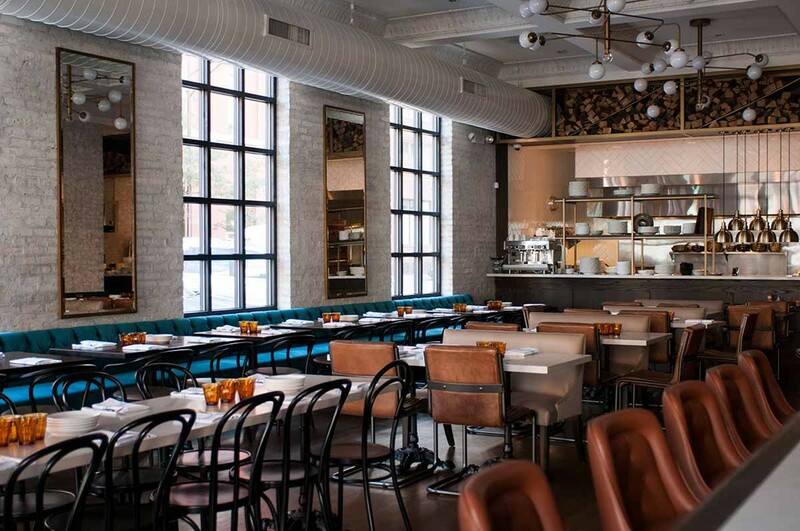 But its ambience—brass fixtures, teal banquettes, mismatched tables and chairs with a 70s suburban-rec-room feel—doesn't give many clues to what it's all about either. Where am I? Oh yeah, River North. The menu is equally unfocused; the Mediterranean is a big drink of water, after all. Spain, Italy, and southern France all weigh in, but none more memorably than Lebanon, with a dish confusingly called "lamb hashwi." Normally hashwi is a rice dish, but here it's a smooth spread of hummus embedded with pine nuts, pomegranate seeds, and a mince of za'atar-spiced lamb so fine it could be a sauce. It doesn't matter. It's devastating—an eruption of sweet, sour, and savory that's perfect dredged up with scraps of thick, puffy flatbread sheened with olive oil, a confounding but delicious cross between pita and Navajo fry bread. 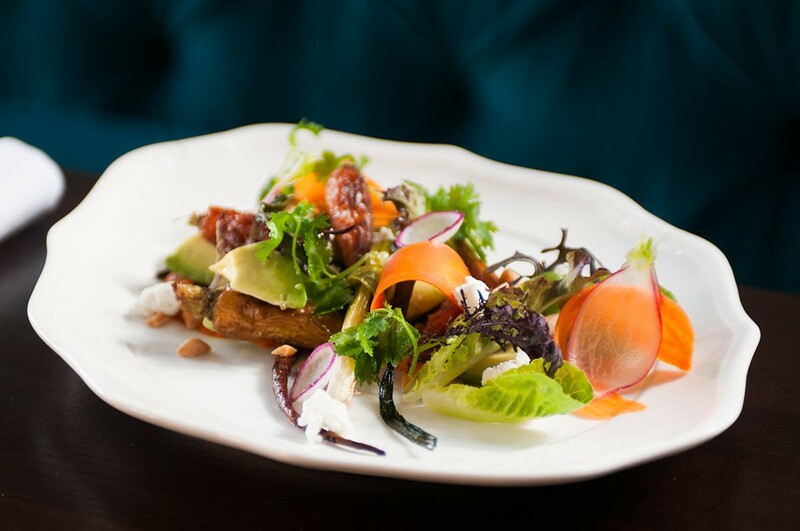 There are a handful of dishes like that across the menu at Bernie's, plates whose initial bites stop you midchew while your brain processes unfamiliar signals: a salad of spinach that tastes as if just pulled from the ground with slivers of tart pickled carrots and whole roasted ones, fattened up by almonds, avocado, and a rich romesco sauce; slices of wood-grilled bread smeared with the summer's last ripe red tomatoes and sprinkled with goaty Garrotxa cheese shavings. 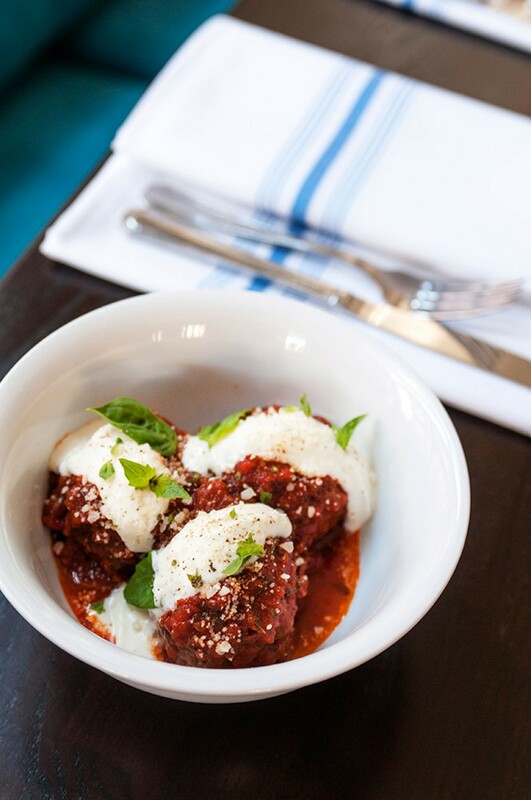 Even a River North commonplace like veal meatballs somehow distinguishes itself, barely holding together under a blanket of deeply umamic tomato sauce. At times Sklar and his cohorts harness a masterful ability to unleash deep powerful flavors in seemingly mundane dishes. Even a few oddballs that don't quite come together show this potential. 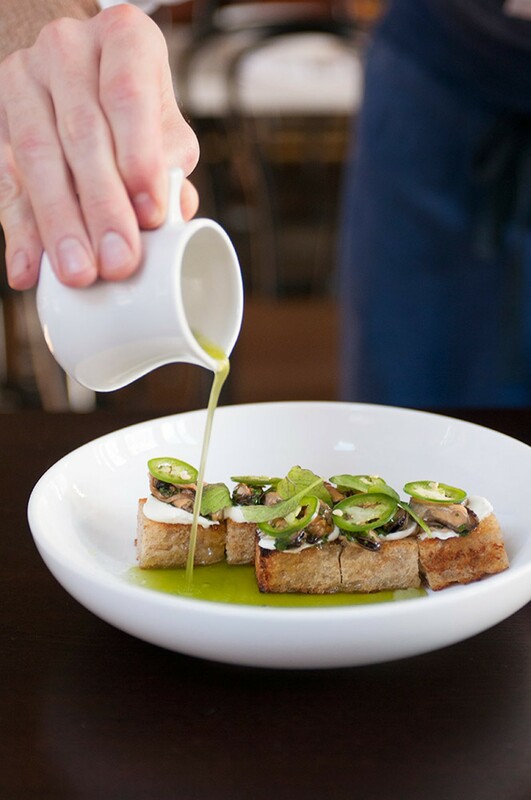 The elements in a small plate of pickled mussels, goat cheese, and raw jalapeño, mounted like ants on a log on a row of ciabatta squares bathing in a pool of bright green basil-and-tomato water, fail to harmonize. Sections of corn cob crusted with pesto and mildly spicy honey make the case for the Italian elote—but they're a mess to eat. Ricotta gnudi are bland, chewy sponges for a meaty mushroom-and-walnut brew intensified by black garlic. I didn't mention the generous portioning of these small, ostensibly shareable plates, but they compete with larger entrees like the heaping pile of strozzapreti (oddly soft in texture, with a tomato sauce far too sweet) that I gather isn't long for the menu, or a showstopper grilled salmon "chop" (a large section of vertebra extends from its flesh like a rib), garnished with ribbons of serrano ham, tiny summer squash, and a tart green-olive chimichurri sauce. But it's hard to complain much about almost any of these dishes execution-wise, apart from a too dry roasted half chicken and an overcooked pair of striped bass fillets in a pleasantly sweet, rich chowder with clams, corn, and bacon. 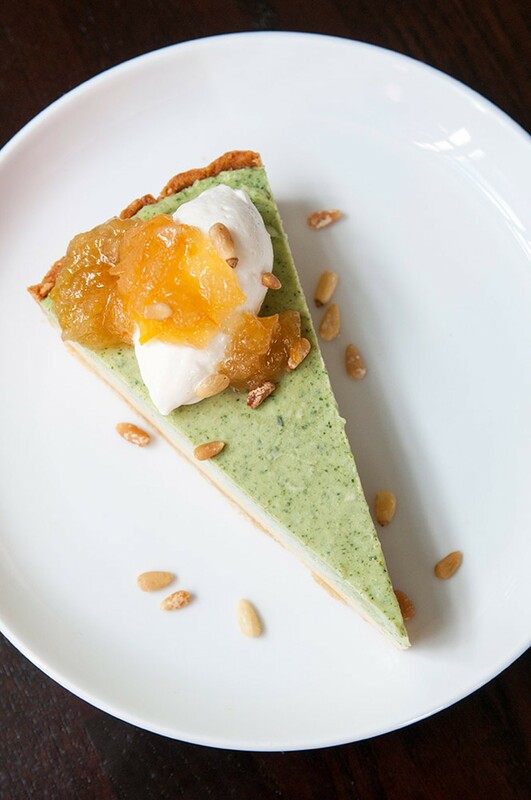 If you haven't gathered by now, the current menu is heavily dependent on summer produce—corn, tomatoes, squash, carrots—and it'll be interesting to see how Sklar's people interpret this sunny food come fall and winter, after he's moved on to his next venture (earlier this spring he told Crain's Detroit Business his goal is to open 70 restaurants). In addition to those seasonally dependent dishes, there are a handful of concessions to picky eaters unwilling to get behind the already vague concept: a cheeseburger, a turkey burger, a French dip sandwich, cotes de boeuf for two. 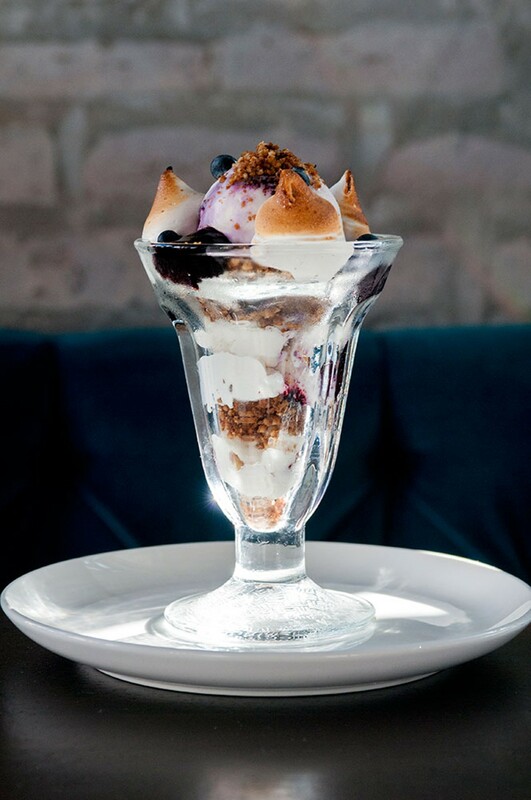 Desserts are equally unbounded regionally, with seven options like a lemon icebox pie with a minty top layer that incorporates vivid green avocado, and a blueberry cobbler sundae with fruity compote, tart frozen yogurt, crunchy oatmeal streusel, and dense, creamy toasted marshmallow fluff. The wine list is refreshingly brief, with mostly a single option for each varietal (and not limited to the Mediterranean). The beer list—draft, large format, and bottles and cans—is mostly local (Michigan, Illinois, and Wisconsin), and a handful of cocktails include subdued, not overly sweet concoctions like the Ain't No Cure, with bourbon and blackberry liqueur, or the more food-friendly My Dream Come True, with vermouth, cava, and Combier.